Macy’s, Inc. reported continued sales and earnings growth in the fourth quarter and full year 2014, ended Jan. 31, 2015. In fiscal 2014, the company attained its long-term profitability target and has now turned its focus to driving additional profitable sales growth through a series of organic and new businesses initiatives. The company’s growth journey remains guided by Macy’s core business strategies  My Macy’s localization, Omnichannel integration and Magic Selling  which are known by the acronym of M.O.M. 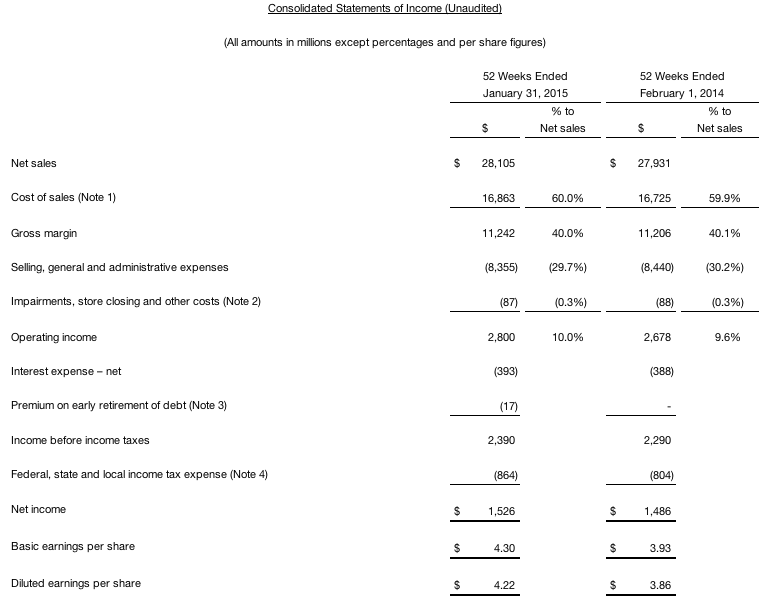 For the full year 2014, earnings were $4.22 per diluted share, or $4.40 excluding items described below. This represents an increase of 9 percent, or 10 percent excluding items described below, over fiscal 2013. The $4.40 per share is in line with management’s initial guidance provided at the beginning of the year for earnings per share, excluding items described below, to be in the range of $4.40 to $4.50 per share in fiscal 2014, and better than the revised guidance in the range of $4.25 to $4.35 provided at the end of the third quarter. Comparable sales growth on an owned plus licensed basis in the full-year 2014 was 1.4 percent. On an owned basis, full-year 2014 comparable sales grew 0.7 percent. “Having now reached such a healthy profitability rate, we are shifting our resources and energies to growing the topline faster while maintaining this high profitability rate level. As described in various announcements made over the past 45 days, we have now fully aligned our management team to fuel organic growth within our existing omnichannel business as customer shopping patterns evolve at both Macy’s and Bloomingdale’s,” Lundgren said. For the 52 weeks of 2014, Macy’s, Inc. sales totaled $28.105 billion, up 0.6 percent from total sales of $27.931 billion in fiscal 2013. Comparable sales growth on an owned plus licensed basis for the full-year 2014 was 1.4 percent. On an owned basis, full-year 2014 comparable sales grew 0.7 percent. Sales in the 13-week fourth quarter of 2014 totaled $9.364 billion, up 1.8 percent from total sales of $9.202 billion in the fourth quarter of 2013. Comparable sales growth on an owned plus licensed basis for the fourth quarter was 2.5 percent. On an owned basis, fourth quarter comparable sales grew 2.0 percent. In fiscal 2014, the company opened five stores and closed 22 stores, all as previously announced. Macy’s opened new stores in Sarasota, FL; Las Vegas, NV; and The Bronx, NY. Bloomingdale’s opened a new replacement store in Palo Alto, CA, and closed an older store in the same center, as well as opened a new furniture clearance store in Wayne, NJ. Macy’s closed stores in Phoenix, AZ; Cupertino, CA; Woodland Hills, CA (2); Bradenton and Port Richey, FL; Southfield, MI; Greensboro, NC; Ledgewood, NJ; DeWitt and Schenectady, NY; Columbus, Richmond Heights and Springfield, OH; York, PA; and Memphis, TN. In addition, Macy’s combined three stores into two in the same mall in Torrance, CA, and consolidated two stores into one in the same centers in Minnetonka, MN, Houston, TX, and Arlington, VA. Bloomingdale’s closed a furniture clearance store in Mt. Pleasant, NY. For fiscal 2014, Macy’s, Inc.’s operating income totaled $2.800 billion or 10.0 percent of sales, compared with operating income of $2.678 billion or 9.6 percent of sales for fiscal 2013. Macy’s, Inc.’s fiscal 2014 operating income included expenses and asset impairment charges of $87 million associated with the previously announced merchandising and marketing restructuring, store and field adjustments, and store closings. This is lower than previously expected because of lower severance costs. Of this $87 million, $33 million was related to non-cash write-offs related primarily to store closings. Excluding these items, operating income for fiscal 2014 was $2.887 billion or 10.3 percent of sales. Macy’s, Inc.’s fiscal 2013 operating income included asset impairment charges and other costs and expenses of $88 million primarily associated with store closings, cost reduction initiatives and related items. Excluding these items, operating income for fiscal 2013 was $2.766 billion or 9.9 percent of sales. Macy’s, Inc.’s operating income totaled $1.364 billion or 14.6 percent of sales for the 13-week quarter ended Jan. 31, 2015, compared with operating income of $1.349 billion or 14.7 percent of sales for the fourth quarter of fiscal 2013. Macy’s, Inc.’s fourth quarter 2014 operating income included expenses and asset impairment charges of $87 million associated with the previously announced merchandising and marketing restructuring, store and field adjustments, and store closings. Excluding these items, operating income for the fourth quarter of 2014 was $1.451 billion or 15.5 percent of sales. Fourth quarter 2013 operating income included asset impairment charges and other costs and expenses of $88 million primarily associated with store closings, cost reduction initiatives and related items. Excluding these items, operating income for the fourth quarter of 2013 was $1.437 billion or 15.6 percent of sales. For the full-year fiscal 2014, Macy’s, Inc. earned $4.22 per diluted share, an increase of 9 percent from fiscal 2013. Earnings per diluted share for fiscal 2014 were $4.40 after excluding charges of $87 million ($54 million after tax or 15 cents per diluted share) associated with previously announced merchandising and marketing restructuring, store and field adjustments, store closings and asset impairments, as well as $17 million ($10 million after tax or 3 cents per diluted share) of interest expense related to the make-whole premium for the early retirement of debt. This represented an increase of 10 percent compared with 2013 earnings per diluted share excluding certain items. For fiscal 2013, Macy’s, Inc. earned $3.86 per diluted share. Earnings per diluted share for fiscal 2013 were $4.00 after excluding pre-tax expenses and asset impairment charges of $88 million ($54 million after tax or 14 cents per share) associated with store closings, cost reduction initiatives and related items. Fourth quarter 2014 earnings were $2.26 per diluted share, or $2.44 excluding charges of $87 million ($54 million after tax or 15 cents per diluted share) associated with previously announced merchandising and marketing restructuring, store and field adjustments, store closings and asset impairments, as well as $17 million ($10 million after tax or 3 cents per diluted share) of interest expense related to the make-whole premium for the early retirement of debt. described below. The fourth quarter charges of $87 million were lower than the estimate of $100 million to $110 million provided in the company’s Feb. 3 news release on investments for sales growth. This was primarily the result of lower severance expense as the company was able to place more associates than expected in new jobs within the company in the course of its workforce reductions. In the fourth quarter of 2013, earnings were $2.16 per diluted share. Diluted earnings per share for the fourth quarter of 2013 were $2.31 after excluding pre-tax expenses and asset impairment charges of $88 million ($54 million after tax or 15 cents per share) associated with store closings, cost reduction initiatives and related items. Macy’s, Inc. adjusted earnings before interest, taxes, depreciation and amortization (Adjusted EBITDA) rose in 2014 to $3.923 billion, or 14 percent of sales. The company had previously targeted an EBITDA rate of 14 percent. Achieving this target represents significant progress over the past six years since the company adopted a unified organizational structure and market localization in 2009. The company’s Adjusted EBITDA rate as a percent to sales was 11.3 percent in fiscal 2009. Net income for 2014 was $1.526 billion, or 5.4 percent of sales, compared to net income for 2009 of $329 million, or 1.4 percent of sales. Net cash provided by operating activities was $2.709 billion in fiscal 2014, compared with $2.549 billion in fiscal 2013. Net cash used by investing activities in fiscal 2014 was $970 million, compared with $788 million in the previous year. Thus, net cash provided before financing activities was $1.739 billion in fiscal 2014, compared with $1.761 billion in fiscal 2013. In fiscal 2014, the company repurchased approximately 31.9 million shares of its common stock for approximately $1.9 billion. At Jan. 31, 2015, the company had remaining authorization to repurchase up to approximately $1.0 billion of its common stock. The company expects comparable sales growth on an owned plus licensed basis, as well as on an owned basis, of approximately 2 percent in fiscal 2015. Total sales are expected to grow about 1 percent in fiscal 2015. Earnings of $4.70 to $4.80 per share are expected in 2015. Capital expenditures for 2015 are expected to be approximately $1.2 billion, an increase from $1.07 billion in 2014, reflecting new investment in growth initiatives. In fiscal 2015, the company expects to open a new Macy’s store in Ponce, PR, and a Bloomingdale’s in Honolulu, HI. For fiscal 2016, a new Macy’s store has been announced for opening in Kapolei, HI, along with a replacement Macy’s store in Los Angeles, CA. Announced new stores for fiscal 2017 include new Macy’s and Bloomingdale’s in Miami, FL, and a new Bloomingdale’s in San Jose, CA. In addition, new Macy’s and Bloomingdale’s stores are planning to open in Abu Dhabi, United Arab Emirates, in 2018 under license agreements with Al Tayer Group.